Something that doesn’t get talked about often, perhaps because it doesn’t happen often, is the courage and confidence it takes for a company to stand up to its detractors, and to tell its customers why. In the era of Twitter, Snapchat, Facebook, and YouTube, most companies fear controversy more than ever, and instinctively hunker down at the hint of any bad publicity, irrespective of the truth. Not only do companies want to avoid confrontation, but they refuse to hold activist detractors’ accountable, validating customers’ suspicions that the detractors may be on to something after all. 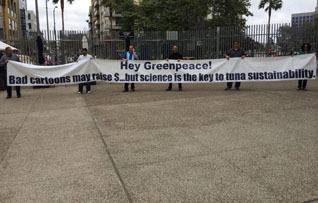 That’s why we have to applaud Bumble Bee’s employees for standing up to Greenpeace’s bogus ocean allegations, in full view of its employees and San Diego VIPs including Mayor Kevin Faulcone and Ron Fowler, Chairman of the San Diego Padres. Undeterred by worries over negative PR, Bumble Bee employees seized the opportunity to go “sign to sign” with Greenpeace, calling out the group’s fundraising motives and the lack of scientific data behind its sustainability accusations against the company. Even local businesses are showing they are not afraid to stand tall against false, and inflammatory claims about the dealership’s business practices. Recently, when a local union picketed one Wichita Subaru dealership for allegedly employing unfair labor practices during their remodeling, the dealership hit back with its own banner and flyer, and posted both on their website along with a detailed explanation of the dispute for their customers. The dealership’s customers stood up in support of the dealership, in large part because they went “banner to banner” against their detractors, and told their customers why the union’s allegations were false. More companies who have been wronged by unprincipled adversaries can learn a lesson from the likes of Bumble Bee and Subaru of Wichita.